SR-100-ST20D DIN Rail Media Converter. Extend 100Base-TX to 100Base-BX 1550nm TX / 1310nm RX single mode with single strand fiber ST connector. Distances up to 20 km/12.4 mi. SR-100-ST20D- Fast Ethernet Industrial Media Converter: 100Base-TX (RJ-45) [100 m/328 ft] to 100Base-BX 1550nm TX / 1310nm RX single strand fiber, single mode (ST) [20 km/12.4 miles]. DIN Rail case, terminal block (Combicon) power connector for external power source. 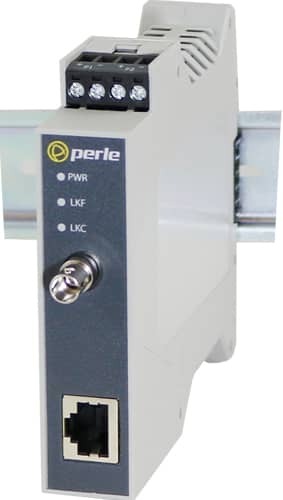 Perle SR-100 DIN Rail Media Converters transparently connect Fast Ethernet UTP CAT5/6/7 copper to single strand fiber. When Single Strand ( also referred to as Bi-Directional, BiDi or Simplex) fiber is used, a pair of devices, also referred to as Up/Down models, is needed for the fiber conversion. Learn more.